San Diego's popular 24 hour coffee hangout, Lestat's Coffee House, is in the process of opening a new location in Hillcrest, anticipated to debut on August 9. Lestat's Coffee House first opened at 3343 Adams Avenue in Normal Heights in 1997 and became a 24 hour shop in 2002. The popular coffee destination has been open 24 hours a day, 7 days a week, without closing, for the past 8 years at its original location, which also has a neighboring music venue, Lestat's West, that hosts popular bands. In 2010 Lestat's owners John Husler and Jamie Gerkowski opened a second outpost at 4496 Park Boulevard in University Heights. We recently learned that a third location is underway in the space that previously housed Kato Sushi at 1045 University Avenue in Hillcrest, which could open as early as this summer. 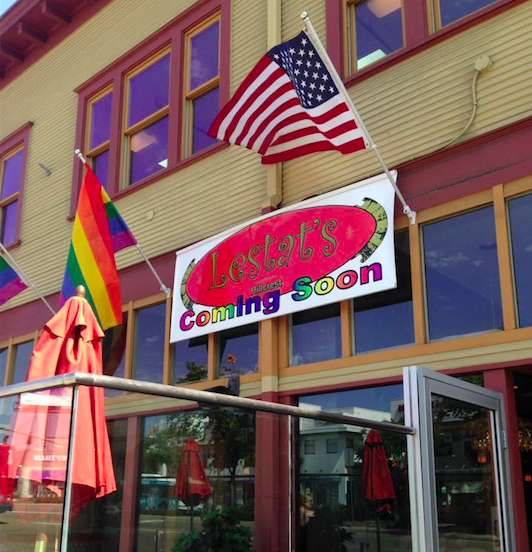 The new Lestat's location in Hillcrest will not be open 24 hours a day to start, but aims to evolve into an always-open coffee house. The new location will continue the tradition of frequent musical, comedy and live spoken word performances, but on a smaller scale. The space is undergoing a remodel to incorporate Victorian era inspired stylings, an outdoor patio, and a comfortable ambiance. Like other locations, Lestat's on University will serve a variety of coffee concoctions, deli & breakfast sandwiches, pastries, and salads. For more information on Lestat's Coffee House locations, visit lestats.com.